Paint technology has evolved in recent years to the point where the painting window has enlarged considerably. This window is controlled by factors like ambient temperature, season, and direct sunshine. Now, for example, you can paint your home in far lower temperatures than ever before. Some premium paints even allow you to paint in temperatures as low as 35 F.
Even though you still cannot paint your home when rainwater is coursing down the siding, what about in-between conditions, such as when it is humid? If so, how much humidity is acceptable before you risk paint failure? 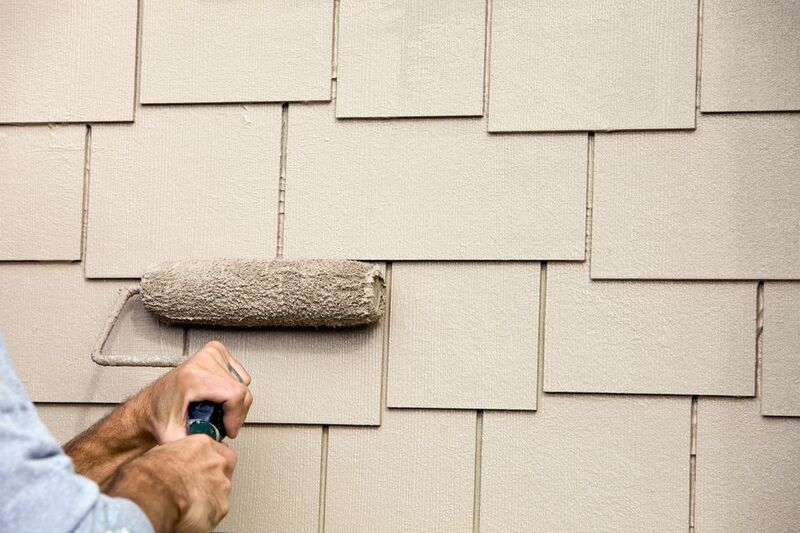 If you delayed on painting your house due to humidity, you would never finish your project. No place is ever not humid. Even an arid city like Phoenix, Arizona at the height of summer will carry some degree of humidity in the air. This question becomes more important for anyone who lives in a damp climate, since a moist surface is one of the main causes of failed paint. In fact, fully wet wood siding requires several sunny and/or windy days to dry properly before painting, according to Mark Knaebe, a chemist at the USDA Forest Products Laboratory. In rain, dew, or other high-moisture conditions, the main issue is not the dampness of the air but how this dampness translates to the surface you intend to paint. Humidity does not have to bar you from painting. According to Knaebe, the way that humidity affects a painting surface comes down to a race between drying times of water in the paint versus the solvents in the paint. In other words, which will dry first? Water needs to evaporate at a rate as fast or faster than the solvents. If the water interferes with solvent-drying, then the paint cannot form a hard surface. According to Knaebe, conditions that are too humid mean that the water cannot evaporate at a faster rate than the solvents. The paint is struggling to cure itself but it cannot do so when it is in such a water-logged state. It becomes a one-way path, a painting disaster that cannot be solved under current conditions. The only solution, then, is to strip away that gunky, wet paint and start fresh. Using oil-based paints will not help, either. Oil-based paints will encounter the same problems as water-based latex paints. Optimal relative humidity (RH) levels for exterior painting tend to be in the 40 percent to 50 percent range. Some humidity is desirable in order to perfectly calibrate the drying rate. As an extreme example, a dark surface painted in direct sunlight will cure so fast that brush marks remain in place and uneven glossiness (called paint flashing) will occur. Paint that is allowed to dry slower will level out its brush marks and the sheen will remain consistent. Yet creeping up the humidity scale, levels in the 70 percent zone will drastically slow drying and curing. But these humidity levels will still not prevent you from painting altogether. They simply make the job more difficult and painstaking. Painting above an RH level of 85 percent is strongly not recommended. The paint will remain gummy and gel-like until the RH lowers to an acceptable level long enough for the paint to solidify. However, because the paint has not been allowed to level properly, the texture will remain wavy and otherwise unacceptable. One tip for flawless exterior painting is to time your painting session so that temperatures are actively on the rise. Make sure that you begin your session several hours before the day's peak temperature, which is usually in the late afternoon. It's tempting to wait until temperatures are higher to begin painting. But by building in a few hours of head-start time, you give the paint enough time to do its job. If not, the paint may stop coalescing, permitting moisture to enter the painted surface and deter or prevent evaporation of paint's moisture. The result may be surface staining and poor adhesion. Start early, but not too early. If you begin too early in the day, you have to contend with accumulated moisture remaining on the surface from the previous night. If you are painting a previously coated surface, you can wait until late morning or about noon, when the dew has burned off of the surface. When the moisture visibly appears to be gone, you can be confident that it truly is gone. But the story is different when it comes to uncoated, raw wood. Uncoated wood is highly porous and will retain moisture within the wood's cellular core, even if it looks and feels dry. Your window of available painting time shrinks. For situations like these, you often have no choice other than to wait for a warmer, drier season. Is Interior Painting Affected by Humidity? Interior painting is a different matter, so interior walls are rarely affected by humidity. First and foremost, interior conditioning means that humidity levels can be controlled. Even if you are not expressly controlling the home's humidity with a humidifier or dehumidifier, your HVAC system, baseboard heater, window AC, or other heating/cooling devices already do the job for you. Second, interior surfaces are protected and should not be subject to moisture settling overnight. Unless you have some unusual situation, your interior walls should never be wet. Bathroom walls are one exception, though, since they can build up moisture after the tub or shower has been used.